Welcome to Almost Home Infant Care & Preschool! Providing child care and preschool education to children 6 weeks to 8 years of age. Almost home is an award winning program recognized for exceeding state standards in curriculum development, class sizes and teacher to child ratios. 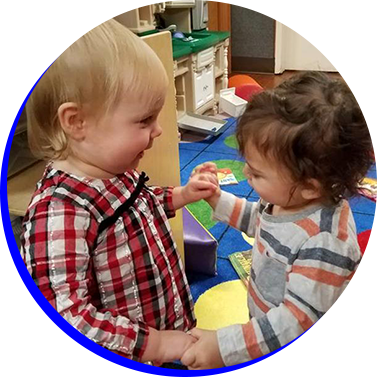 We educate and care for infants, toddlers, preschoolers and school children in a beautiful and peaceful, home-like setting. Almost home is a family-oriented center that partners with all of our best community resources to provide a rich and meaningful educational experience for your child. Almost Home is also designated an Ohio Healthy Program by the Ohio Dept of Health, has been rated 4-Stars by the Ohio Dept of Job & Family Services for exceeding state mandates for quality, education and staff credentials. Monday - Friday: 6 AM - 6 PM (year round). Full-time programs for infants, toddlers and preschoolers. Before and after school care for children 6-8 years old. Full-time summer camp for school children 6-8 years old. Half-day preschool programs for 3, 4 and 5 year olds during the academic year. Almost home is owned by a registered nurse and former high school teacher, Toni Poling. Our staff is 100% certified in first aid, CPR, childhood illnesses and child abuse recognition. All of our preschool teachers hold a bachelor’s degree as do some of our toddler staff. Most of our infant & toddler caregivers are moms themselves. Our staff is chosen for their patience, love of children and sense of humor. Happy, healthy children receiving the best possible education is the very foundation of what we do. © 2018, Almost Home Infant Care & Preschool. All Rights Reserved.